To reach this cemetery from Florence, Alabama, travel Alabama Highway 20 west and turn left onto County Road # 14 (Waterloo Rd.). Travel to Waterloo and follow County Road 14, turning right (Bumpus Creek Road) and travel 4.9 miles passing Bumpus Creek Free Will Baptist Church. The next road to the left is County Road # 146, which is unpaved. Turn left up the hill (0.1 mile) and the cemetery is on the right. 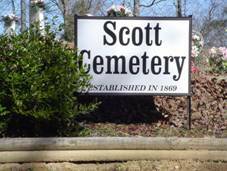 The Scott Cemetery is located near Waterloo, Alabama, in western Lauderdale County. This cemetery was established in 1869. The cemetery was originally a family burial ground. There are 64 graves in this cemetery that do not have identifying markers. The first wife of Poindexter Scott, who is buried here, was Mahala (Lamb). The Lamb family is reported to have given the plot for this cemetery. The cemetery is well maintained. 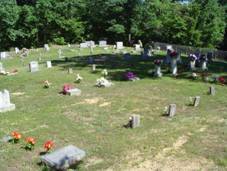 The annual decoration day at Scott Cemetery is the 2nd Sunday in June. Fielder, Victoria (Scott); b. 21 Aug 1865, d. 30 Jan 1939, wife of Samuel N.
Lard, Mary Etta; b. 22 Oct 1896, d. 17 Aug 1931, wife of George M.
Mansel, Birdie Mae; b. 26 Mar 1941, d. 29 Mar 1941, daughter of Russell Clifton & Hazel B.
Mansel, Tennessee; b: 12 Dec 1876, d. 13 Dec 1969, wife of Walter L.
Phillips, Larah B.; b. 01 Jun 1886, d. 08 Jun 1942, wife of S.J. Scott, Bessie (Hodges); b. 11 Oct 1913, d. 17 Aug 1988, wife of Homer F.
Scott, Calvin; b. 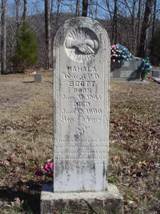 24 Nov 1880, d. 08 Mar 1915, husband of Ola W.
Scott, infant; b. 06 Jan 1899, d. 10 Jan 1899, daughter of W.H. & M.E. Scott, infant; b. 02 Mar 1912, d. 02 Mar 1912, son of W.H. & M.E. Scott, Jessie (Webb); b. 06 Dec 1882, d. 28 Apr 1958, wife of G.W. Tune, Polly Ann (Scott); b. 17 Nov 1870, d. 03 Jul 1945, wife of J.J.
White, Bulah M.; b. 18 Jul 1923, d. 05 Nov 1924, daughter of R.W. & B.W. White, Elizabeth; b. 14 Nov 1864, d. 08 Jun 1921, wife of W.M. White, Katie Austin; b. 1892, d. 1959, wife of Alby A. White, Martha E.; b. Feb 1865, d. 18 Apr 1932, wife of John R.